Divisional Commissioner Office Amravati Has Released Recruitment Notification For 37 Supply Inspector Posts. 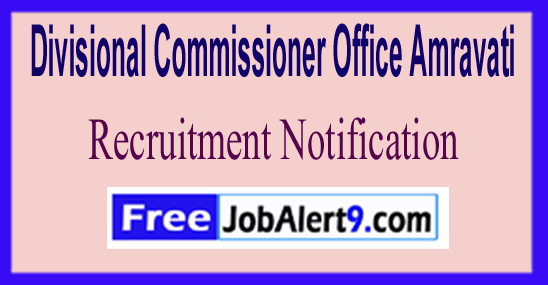 All Eligible & Interested Candidates Can Apply Online.Further Detailed Information Regarding Educational Qualifications, Age Limit, Selection Procedure, Exam Pattern, Syllabus for Divisional Commissioner Office Amravati Recruitment 2017 - 37 Supply Inspector Post is mentioned below. Candidates age should be between 18 to 38 -Years As on (01-05-2017). All Eligible & Interested candidate fill the online application through official web-site (http://amravatidivision.gov.in) before or on (12th June 2017). Starting Date For Online Application Is - 26-05-2017. Online Application Will Be Received Till -12-06-2017. 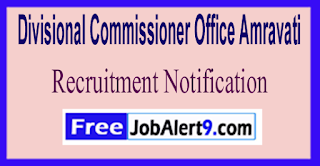 Click Here For Divisional Commissioner Office Amravati Recruitment 2017 Detailed Advertisement.